I spent this weekend plowing through my financial history because I really want to decrease my variable spending. But to do that, I knew that I needed to see what I have been actually spending. I mean, you can't just say "I am going to spend only $50 a month in restaurants" unless you know what you are currently spending and how realistic the reduction is. So, through my bank's website, I downloaded all transactions from my credit cards and chequing account and I took a few hours to sort through and figure out where my money was going. I love the shows Til Debt Do Us Part and Princess, led by Gail Vaz Oxlade, so I often go to her website (www.gailvazoxlade.com) to find inspiration and advice. 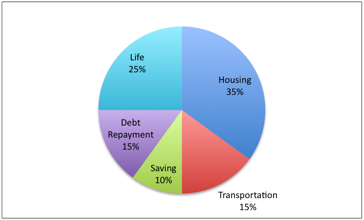 Gail recommends the following pie chart for what your spending should be. I thought this exercise might also be useful to show why I choose to live in such a small home. I make a very good income, but when you add in my mortgage payments, property taxes, insurance, hydro, and maintenance fees (and my locker purchase went in there) it is STILL over a third of my income! If you are thinking of decreasing your spending, the best thing to do is look at these fixed costs and think about if you even HAVE the variable income to live the way that you want. For me, a smaller home means more traveling and nights out! It was an interesting exercise. I always thought I spent too much on restaurants and take out and barely bought clothing, but it turns out I was spending equal amounts on both! AND my restaurant expenditures were not extreme. I also didn't think I spent a lot on travel, but I was shocked to find it was the second largest variable expenditure. I guess two weeks in Europe last fall and an upcoming two weeks in Mexico this fall will do that! The scariest part, however, was my spending on home decor and improvements. I can't remember all the purchases to say which was which, but in stores like Canadian Tire and Ikea (which I went to EIGHT times last year??) I was spending over $300 a month!!!!!!!!!!!!! I guess that does include my new couch and some other new furniture, but I can't dismiss such spending because who knows what I will need to buy in upcoming years. So I need some help on what is the best way to stick to a budget. I have already decided to move my blogging expenditure (aka home decor and improvements!) to discount stores and really be creative with DIY to save money. I am also thinking of going to a jar system to dish out my variable spending and stop my occasional shopping for junk. Help me with some tips for saving money! We just did this last night using mint.com and found we spend WAY to much money eating out! I have a lot of debt from college (not just loans but credit card debt as well) so a lot of my income is out the door before I can even bring it home. We started using the cash system. I budget a set amount for gas, groceries, fun, and household items each week. That amount in cash is placed in an envelope for each category and once that cash is gone, it's gone! Yup Ive got some budgeting ideas in the works and I will share them once I iron out the details.